U.S. Secretary of State John F. Kerry and Kuwaiti First Deputy Prime Minister and Foreign Minister Sheikh Sabah al-Khaled al-Sabah co-chaired the first-ever U.S.-Kuwait Strategic Dialogue on October 21, 2016, in Washington, DC. This dialogue is expected to shape the work of our two countries over the next quarter century in implementing President Barack Obama’s and His Highness the Amir Sheikh Sabah al-Ahmed al-Sabah’s shared vision for bilateral cooperation across the full spectrum of our mutually beneficial partnerships. The two sides discussed specific initiatives to enhance defense, security, economic, commercial, political, educational, scientific, and consular cooperation, and established working groups to make progress in all these and other areas before the next Strategic Dialogue. The United States and Kuwait intend to build on a defense partnership that helps secure mutual national and regional interests. 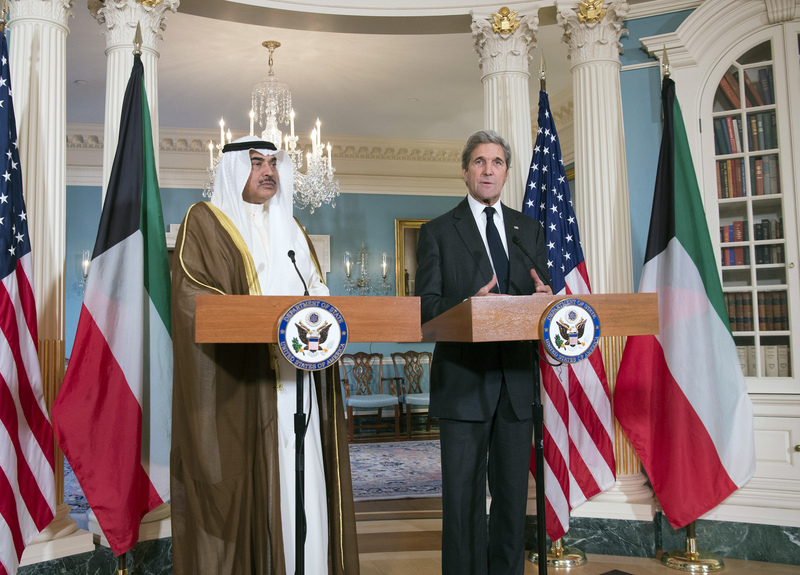 Secretary Kerry thanked Foreign Minister al-Sabah for Kuwait’s help in the fight against Da’esh and its leadership in the Global Coalition to Counter ISIL. The United States is prepared to work jointly with the GCC states, including Kuwait, to deter and confront an external threat to any GCC state’s territorial integrity that is inconsistent with the UN Charter. The Kuwaiti side appreciated the robust defense cooperation between our two countries. The two sides tasked their teams with designing a mutual strategy to implement specific measures to enhance this partnership, and committed to continue their coordination through the U.S.-Kuwait Joint Military Committee. The United States is committed to Kuwait’s security, and to working with Kuwait to secure its homeland. The United States and Kuwait undertook to bolster their security partnership – including but not limited to countering terrorism and terrorist financing, particularly through enhanced information sharing – and look forward to Kuwait’s chairing of the Middle East and North Africa Financial Action Task Force (MENA-FATF) in 2017. They also welcomed Kuwait joining the Kingdom of the Netherlands and Turkey in co-chairing the Global Coalition to Counter ISIL’s Foreign Terrorist Fighter working group. Both sides pledged to continue their efforts in countering violent extremism and in other security matters, such as cyber, and agreed to establish a working group to follow up and ensure continued progress. Both sides recognized the sizable potential business opportunities for expanded economic engagement. Kuwaiti officials described plans to diversify their economy and increase economic cooperation. Both sides encouraged proposals to foster greater U.S. business activity in Kuwait, and to increase investments by Kuwait in the United States. The two countries established a working group to make progress toward these goals. The United States and Kuwait reaffirmed the value of people-to-people connections to our bilateral relationship. Educational exchanges and scientific research between the United States and Kuwait have grown considerably in recent years, and the two countries see opportunities for further broadening and deepening these links. Both countries would like to see more Kuwaitis join the approximately 13,000 individuals already studying in the United States, and pledged to explore ways to enhance support for the academic and professional success of students and scholars to advance our shared national interests. Both sides also committed to exploring new ways to broaden research and technical cooperation between U.S. and Kuwaiti universities and research institutions. The U.S. government also extended an invitation to the Kuwaiti Minister of Higher Education to visit the United States and meet with private sector organizations and institutions of higher education and research. The two sides established a joint working group and charged it with exploring ways to increase the number of exchange students, and devising specific means of expanding scientific research and technical cooperation. In the context of greater people-to-people contact between the United States and Kuwait, the two sides reaffirmed the importance of prompt consular notification for citizens detained in either country, in line with their international obligations. The two sides reiterated their commitment to keeping each other apprised of consular-related matters, and committed to establishing a working group focused on consular issues. They also underscored the need for closer cooperation on customs and immigration matters. The United States and Kuwait look forward to the signing of a Customs Mutual Assistance Agreement before the end of 2016, which would allow greater information sharing, training, and enforcement. Secretary Kerry and Foreign Minister al-Sabah highlighted the shared interests between the United States and Kuwait that form the basis for the continued strengthening of the strategic partnership between the two countries. The working groups established at this meeting intend to consult regularly in order to make tangible progress for the peoples of both countries. The two sides recognize that today’s meeting was a comprehensive exchange that established a roadmap for deepening the Kuwait-U.S. partnership in the coming years and look forward to addressing an even broader agenda in the next Strategic Dialogue in Kuwait in 2017.